Abstract: There is scientific consensus that coral bleaching will increase in severity and regularity as sea surface temperatures rise over the course of the next century. The “HotSpot” model (NOAA) infers that a 1°C anomaly above the mean maximum summer temperature is likely to result in bleaching. This temperature threshold is combined with the duration of heat stress into a “degree heating week” (DHW) model, which aims to predict mass bleaching and mortality events worldwide. However, observational and experimental evidence has indicated that coral populations’ bleaching response and level of thermotolerance is not uniform. It has been suggested that intrinsically thermotolerant populations should be identified and conserved to function as coral reef refugia in the face of climate change. Herein, we discuss the Gulf of Aqaba as a likely coral refuge. 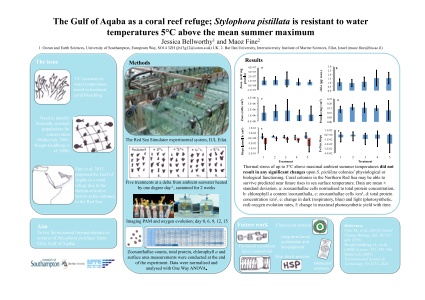 Stylophora pistillata, a common shallow water scleractinian coral, was exposed to a succession of temperatures up to 5°C above ambient at the peak of summer in Eilat, Israel. The intensity and duration of heat stress was equivalent to 9 DHW which, in other regions, has previously induced “widespread bleaching and some mortality”. The experimental corals showed no visible signs of temperature-induced bleaching and physiological tests revealed no significant differences between treatments and controls. It is concluded that S. pistillata in Eilat live well below its thermal bleaching threshold and may therefore survive significant future global warming. Future research aims to investigate the evolutionary origin and mechanisms behind this characteristic and to assess whether the thermotolerant propensity is a result of phenotypic acclimatisation or adaptation. The findings of these studies will be used to examine the likelihood of using Red Sea corals to replenish reefs affected by bleaching events.